Annual (9), or perennial (340). Rhizomes absent (303), or short (41), or elongated (6). Stolons absent (342), or present (6). Culms erect (159/173), or geniculately ascending (35/173), or decumbent (3/173), or rambling (1/173), or scandent (1/173); reed-like (1/21), or robust (11/21), or slender (9/21); 5-57.24-300 cm long; compressible (3), or firm (334), or wiry (8), or woody (3). Culm-internodes terete (7/8), or channelled (1/8). Culm-nodes constricted (5/34), or flush with internodes (5/34), or swollen (25/34). Lateral branches lacking (42/53), or sparse (6/53), or ample (6/53), or fastigiate (2/53), or suffrutescent (1/53). Leaves differentiated into sheath and blade (347), or with blades commonly suppressed, transferring photosynthetic function to sheath and culm (1). Leaf-sheath auricles absent (341), or erect (9). Ligule an eciliate membrane (242), or a ciliolate membrane (96), or a ciliate membrane (12), or a fringe of hairs (5), or absent (3). Leaf-blades persistent (342), or deciduous at the ligule (7); aciculate (5), or filiform (190), or linear (156), or lanceolate (1), or elliptic (1); herbaceous (343), or coriaceous (5); stiff (61), or firm (288). Leaf-blade surface with rectangular ribs (2/2). Leaf-blade apex muticous (316), or pungent (36). Inflorescence a panicle (347), or comprising only a few spikelets (1); terminal, or terminal and axillary (2); not deciduous as a whole (346), or deciduous as a whole (2); subtended by an unspecialized leaf-sheath (331), or an inflated leaf-sheath (16), or bracts (1); exserted (272), or embraced at base by subtending leaf (91), or enclosed (1). Peduncle cylindrical at apex (1/2), or tipped by a glumaceous appendage (2/2). Panicle open (198/347), or contracted (157/347), or spiciform (7/347). Primary panicle branches not whorled (337/347), or whorled at most nodes (10/347). 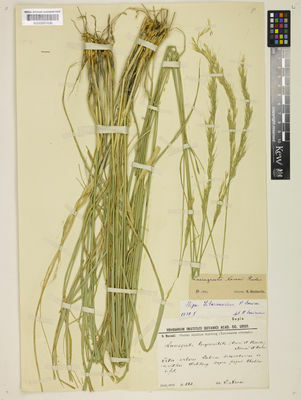 Spikelets appressed (1/1); solitary, or in pairs (2). Fertile spikelets sessile (1), or pedicelled. Pedicels filiform (10/10); tip widened (3/3). 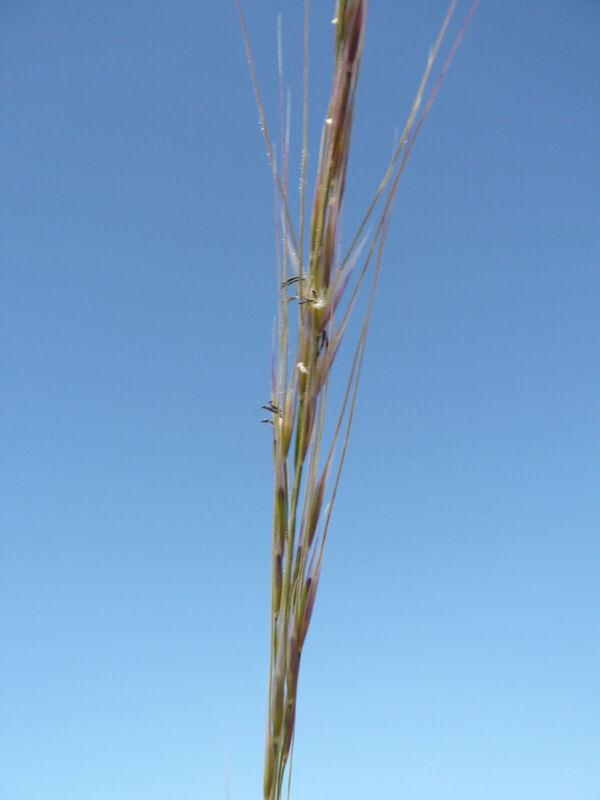 Basal sterile spikelets absent, or rudimentary (1). Spikelets comprising 1 fertile florets (347), or 7-10 fertile florets (1); without rhachilla extension. Spikelets linear (31/346), or lanceolate (309/346), or elliptic (3/346), or oblong (1/346), or ovate (1/346), or oblanceolate (1/346), or cuneate (1/346); laterally compressed (19), or subterete (325), or dorsally compressed (4); 2.3-21.23-95 mm long; breaking up at maturity; disarticulating below each fertile floret. Spikelet callus brief (347), or square (1); pubescent (1/1); base acute (1/1). Floret callus brief (58), or evident (129), or elongated (162); glabrous (26/274), or sparsely hairy (2/274), or pubescent (196/274), or pilose (38/274), or bearded (16/274); truncate (1), or obtuse (83), or acute (153), or pungent (112), or expanded (1). 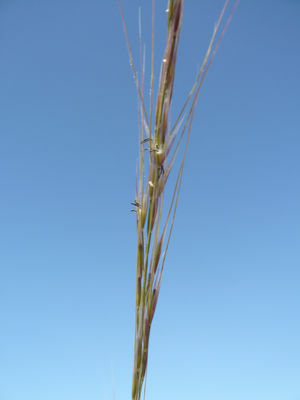 Basal sterile spikelets absent, or rudimentary (1). Spikelets comprising 1 fertile florets (347), or 7-10 fertile florets (1); without rhachilla extension. Spikelets linear (31/346), or lanceolate (309/346), or elliptic (3/346), or oblong (1/346), or ovate (1/346), or oblanceolate (1/346), or cuneate (1/346); laterally compressed (19), or subterete (325), or dorsally compressed (4); 2.3-21.23-95 mm long; breaking up at maturity; disarticulating below each fertile floret. Spikelet callus brief (347), or square (1); pubescent (1/1); base acute (1/1). Floret callus brief (58), or evident (129), or elongated (162); glabrous (26/274), or sparsely hairy (2/274), or pubescent (196/274), or pilose (38/274), or bearded (16/274); truncate (1), or obtuse (83), or acute (153), or pungent (112), or expanded (1). 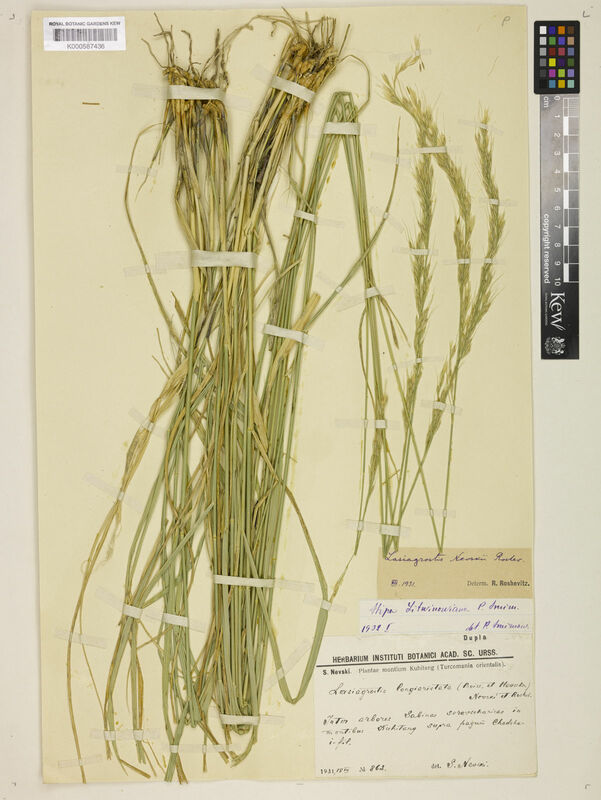 Glumes persistent (337/337); shorter than spikelet (3/347), or reaching apex of florets (6/347), or exceeding apex of florets (340/347); thinner than fertile lemma (334), or similar to fertile lemma in texture (13), or firmer than fertile lemma (1); parallel to lemmas (328), or recurved at apex (1), or gaping (19). Lower glume linear (22), or lanceolate (314), or elliptic (14), or oblong (12), or ovate (4); 0.7-1.034-2 length of upper glume; hyaline (63/347), or membranous (277/347), or chartaceous (4/347), or herbaceous (2/347), or scarious (2/347); without keels (307/333), or 1-keeled (26/333); 0-3-9 -veined. Lower glume lateral veins absent (37), or obscure (13), or distinct (307), or prominent (1), or unequally thickened (1); without ribs (319/322), or ribbed (3/322). Lower glume surface smooth (314), or asperulous (29), or scabrous (12); glabrous (325), or puberulous (15), or pubescent (11), or pilose (6), or hispidulous (1). Lower glume apex entire (345), or erose (3), or dentate (1); 2-3 -fid (1/1); emarginate (1/347), or truncate (2/347), or obtuse (13/347), or acute (58/347), or acuminate (199/347), or attenuate (73/347), or setaceously attenuate (26/347), or caudate (2/347); muticous (343), or mucronate (1), or awned (4). 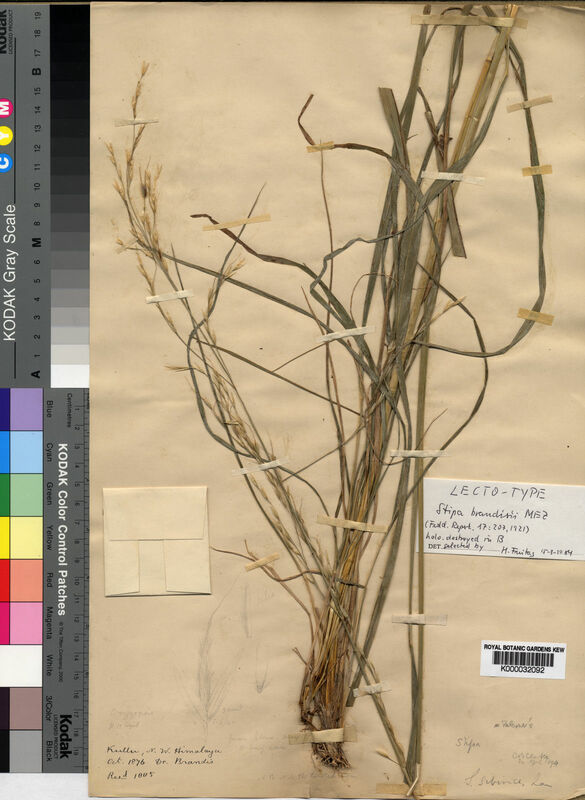 Upper glume linear (23), or lanceolate (310), or elliptic (17), or oblong (12), or ovate (5); 0.6-1.863-5.3 length of adjacent fertile lemma; hyaline (75), or membranous (268), or chartaceous (2), or herbaceous (2), or scarious (2); with undifferentiated margins (332), or hyaline margins (14), or scarious margins (2); without keels (327/346), or 1-keeled (18/346), or 2-keeled (1/346); 0-4-9 -veined. Upper glume primary vein eciliate (343/347), or ciliolate (4/347), or ciliate (1/347). Upper glume lateral veins without ribs (335/338), or ribbed (3/338); without cross-veins (1/3), or with cross-veins (3/3). Upper glume surface smooth (315), or asperulous (29), or scabrous (11); glabrous (326), or puberulous (15), or pubescent (10), or pilose (5), or hispidulous (1). Upper glume apex entire (343), or erose (5); emarginate (1), or truncate (2), or obtuse (14), or acute (63), or acuminate (192), or attenuate (77), or setaceously attenuate (26), or caudate (3); muticous (339), or mucronate (5), or awned (4); 1 -awned (4/4). Fertile lemma linear (62), or lanceolate (225), or elliptic (66), or oblong (7), or ovate (2), or oblanceolate (5); laterally compressed (4/347), or subterete (341/347), or dorsally compressed (2/347); not gibbous (346), or gibbous (2); membranous (16), or chartaceous (12), or herbaceous (1), or scarious (3), or coriaceous (318); without keel (343/344), or keeled (1/344); 1 -veined (1/233), or 3 -veined (19/233), or 4 -veined (5/233), or 5 -veined (217/233), or 6 -veined (2/233), or 7 -veined (3/233). Lemma midvein eciliate (340), or ciliolate (1), or ciliate (4), or pubescent (3). Lemma lateral veins obscure (2/3), or with distinct primaries but obscure intermediates (1/3). Lemma surface smooth (308), or granulose (7), or asperulous (2), or scaberulous (10), or scabrous (12), or papillose (7), or tuberculate (5); unwrinkled (347), or rugulose (1); glabrous (38), or puberulous (12), or pubescent (206), or pilose (76), or hirsute (3), or villous (18), or hispidulous (1); hairy on back (235/312), or on veins (9/312), or between veins (4/312), or in lines (65/312); without hair tufts (321), or with conspicuous apical hairs (28). Lemma margins flat (5), or involute (1), or convolute (342); exposing palea (8), or covering most of palea (339), or interlocking with palea keels (1); eciliate (330), or ciliate (10), or pubescent (8). Lemma apex entire (272), or dentate (75), or lobed (7); 2 -fid (82/82); incised 0.2-0.25-0.3 of lemma length; emarginate (8/28), or truncate (1/28), or obtuse (2/28), or acute (14/28), or attenuate (3/28), or rostrate (2/28); without ornament (337), or scabrous (5), or pubescent (6); without appendage (255), or with a membranous corona (1), or surmounted by a ring of hairs (90), or with a short cylindrical neck (11); muticous (1), or mucronate (1), or awned (346); 1 -awned (345/346), or 2-3 -awned (1/346). Principal lemma awn median (346/347), or eccentric (1/347); apical (284/347), or subapical (1/347), or from a sinus (65/347); straight (25/347), or curved (13/347), or flexuous (11/347), or geniculate (124/347), or bigeniculate (198/347); limb glabrous (221/347), or puberulous (18/347), or pubescent (18/347), or ciliate (9/347), or hirsute (14/347), or plumose (72/347). Column of lemma awn glabrous (155/316), or hispidulous (4/316), or puberulous (36/316), or pubescent (45/316), or ciliate (17/316), or hirtellous (11/316), or hirsute (19/316), or plumose (37/316). Lateral lemma awns shorter than principal (1/1). Palea not rolled (339), or tightly convolute around flower (9); 0.2-0.8884-6 length of lemma; hyaline (2), or membranous (330), or chartaceous (2), or scarious (1), or coriaceous (13); 0 -veined (11/270), or 1 -veined (2/270), or 2 -veined (258/270); without keels (329), or 2-keeled (19). Palea keels eciliate (18/19), or ciliolate (1/19). Palea surface glabrous (259), or puberulous (17), or pubescent (43), or pilose (27), or hirsute (2), or villous (4). Palea apex entire (1/4), or erose (1/4), or dentate (1/4), or lobed (1/4). Lodicules 2 (51/178), or 3 (134/178); membranous (15/15); glabrous (177/178), or ciliate (2/178); obtuse (1/5), or acute (4/5). Anthers 1 (4/286), or 3 (283/286). Stigmas 2 (269/270), or 3 (1/270). Ovary glabrous (173/173). Caryopsis with adherent pericarp (266/266); linear (2/142), or lanceolate (1/142), or fusiform (132/142), or ellipsoid (2/142), or oblong (3/142), or obovoid (2/142); isodiametric (2/4), or laterally compressed (1/4), or dorsally compressed (1/4). Embryo 0.1-0.2721-0.5 length of caryopsis. Hilum elliptic (2/231), or linear (229/231); 0.15-0.7493-1 length of caryopsis. Cleistogenes absent (345), or present (3); in upper sheaths (1/3), or in lower sheaths (3/3). Europe (47), or Africa (21), or Temperate Asia (132), or Tropical Asia (29), or Australasia (67), or Pacific (1), or North America (38), or South America (76). Lemma convolute or with the margins not overlapping at the base, linear, terete or slightly dorsally compressed, glabrous or hairy, minutely bilobed at the tip; callus pungent, or sometimes short and obtuse; awn persistent, straight, flexuous or once to twice geniculate, twisted below the knee. Stipa consanguinea Trin. & Rupr. Stipa dasyphylla (Lindem.) Czern. ex Trautv. 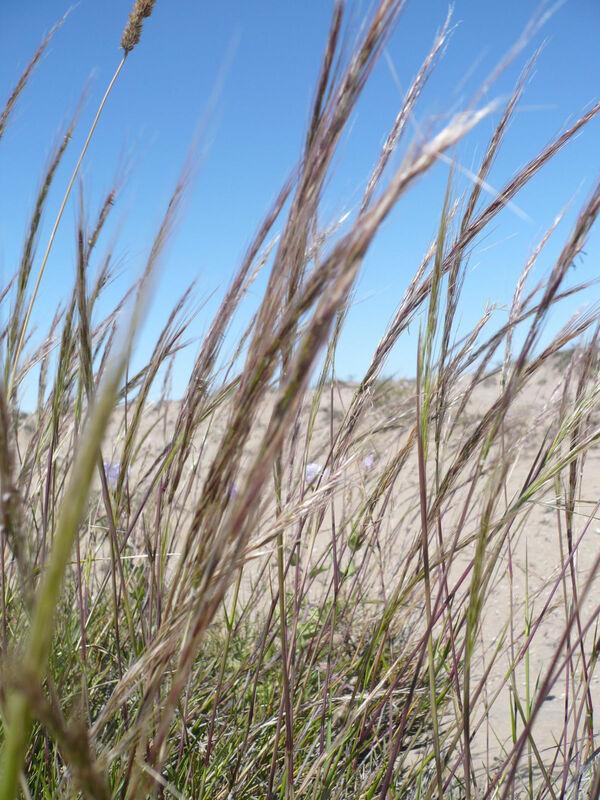 Stipa ehrenbergiana Trin. & Rupr. 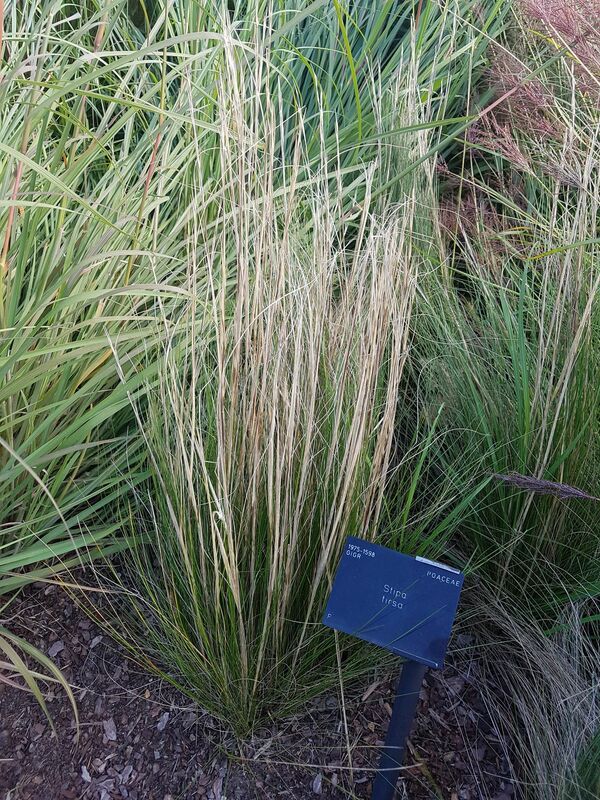 Stipa neaei Nees ex Steud. 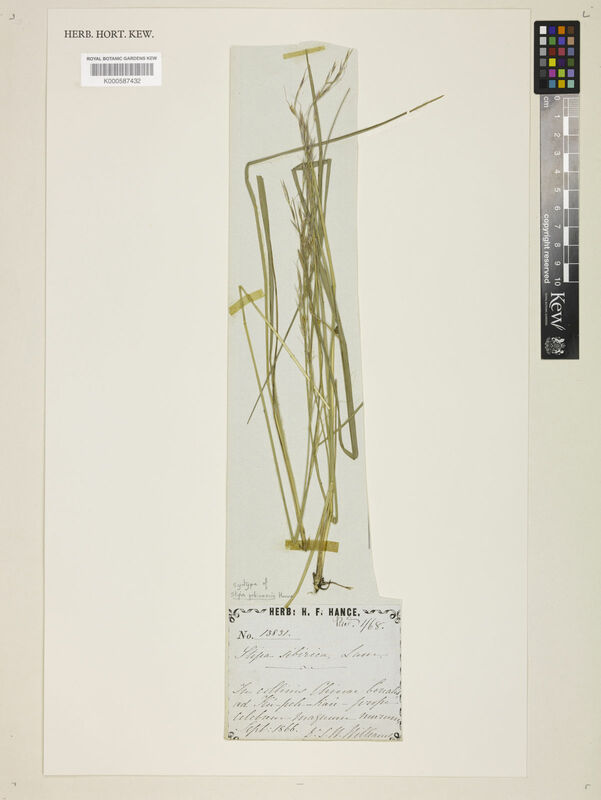 Stipa obtusa (Nees & Meyen) Hitchc. Stipa richteriana Kar. & Kir. Stipa zalesskyi Wilensky ex Grossh.